What message were pirates sending to the world? On a day-to-day basis, most pirates dressed and looked like ordinary sailors, because that is what they essentially were. Being a pirate did not change the work of sailing a ship, only provided more hands to do it and made it pay much better. A sailor need loose clothing to allow movement. Calf-length trousers would not tangle in the ropes when he climbed. He needed a wide leather belt to support his abdomen as he hauled lines. And it was comfortable to have a sash under the belt and bandana tied around his head to absorb sweat as he worked. 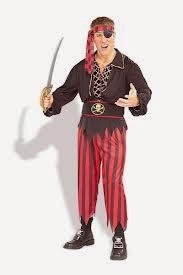 Looking at the cheapest identifiable pirate costume, we see the basics. A puffy-sleeved shirt, striped, ragged pants at a length between ankle and knee, a wide belt and a bandana. Striped pants are the mark of a pirate because patterned fabric, like stripes, was more expensive than an average sailor could afford. When they were in town and needed clothing, pirates had theirs made from the best materials available. As they lived the lives of working pirates, money and travel changed the look of these men. One of the few good descriptions we have is of Henry Avery’s men getting off their ship, the Fancy after years of pirating in the Indian Ocean. They were still dressed in the style of common sailors but the materials had changed. Separated from the materials of their homeland, wool and linen, the men had fashioned European-style clothing from oriental materials. Their shirts and breeches were of bright Indian calicos, spangled Indian silk. They wore patterned paisley, something largely unseen in the Western hemisphere. But they had worked in these clothes. The fine fabrics were worn, torn, patched and dirty. And the men themselves were hard-bitten, work-hardened and tan. This was the classic look of a pirates – grand fabrics in working class styles on working class men. I don’t think this look has been done often enough in pirate costumes… Asian fabric, European construction. It’s a look I plan to exploit in my own future pirate costumes. Anyone want to join me? Working class people weren’t supposed to have good looking clothing. In fact, during the 18th century laws still existed to keep poorer people from owning nice clothes. When trade with India brought calico prints into Europe, it was the first brightly colored, patterned fabric that the poor could afford. But the rich immediately clamped down with laws to prevent working class people from buying or wearing these fabrics. Pirates were already outside the law. 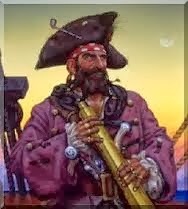 The pirate Jack Rackham expressed himself by buying as much calico as he could get his hands on and having an entire suit made out of it, earning himself the name “Calico Jack.” No one was going to arrest him for his suit when he’d been a pirate for years. Pirates also stole clothes from rich ship passengers and captains. They had no use for the tight, knee length breeches of a gentleman. Besides, who wanted to wear another man’s pants? But the coat was a prize. Gentlemen’s coats and vests of the time were made of silk, satin, velvet, brocade, the most expensive of fabrics. They were often covered in embroidery. A pirate wearing one of these was a successful pirate. That was the message. Very often he was a brave pirate, too. Several ships had rules that the first members of a boarding party, the ones who took the risks, were the ones who got the clothes. Pirates looked for rich things that they could wear. The clothes they stole would quickly fall to pieces from constant wear, dirt, and lack of care. 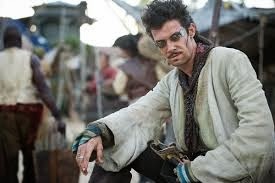 The look of a man with a grand, expensive coat, a simple sailor’s shirt, and ragged pants was the classic pirate style. Cloth might fall to bits, but jewelry lasted. This was a world before “costume jewelry.” If it looked like gold, it probably was. So poor people did not own jewelry. A pirate, encountering necklaces and earrings did not trouble himself with whether they were mean for a man, a woman or God himself. Bartholomew Roberts, probably the most successful of all pirate captains, was famous for wearing an enormous gold cross, set with many gems. The size of the thing was enormous, as large as a lady’s hand. It was Spanish in origin, probably intended as a gift to a cardinal, or perhaps even the Pope himself. 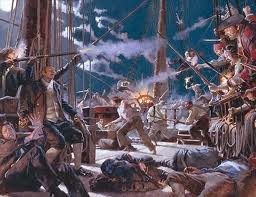 Roberts wore in when he attacked ships, to show everyone what he was capable of doing. That’s another rule of pirate costumes. If you’ve got it, flaunt it. When pirates attacked the next ship, these trophies were puled form sea chests and bags, looking ragged and rakish. Wearing such things showed that pirates had seen action before. It also sent a message to the owners of other wigs and rings and fine buckled shoes that their safe world, the world where the lower classes were content to remain downtrodden, was not going to last. Unlike common working men, the pirates demanded their fair share of the riches available in the new world. And woe to anyone who stood in their way. I'm slowly building fancy dress ensembles that look authentic as possible. Pirate is the first cab off the rank. great information here.